Ahh, sweet fall. A season best known for cozy clothing, hot beverages, pumpkin-flavored dog biscuits, and for those of us here at MVC, the much anticipated VetChallenge put on by the Animal Cancer Foundation. 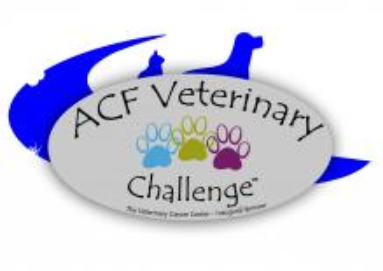 Having won the Challenge for the last two years, the end of October is indeed starting to be known around here as “that time of year again,” and there was no trouble assembling our team for this year’s third annual ACF Veterinary Challenge. This year Emily, Kayla, Chris, Shannon, Jessie and Jeff competed, with Erika and I along to take pictures. Once logistics were all sorted out, all we needed was a team name. Faithful followers of our Facebook page cast their votes for the pun that made them cringe the least (or the most), with the favorite wiping out its competition (much like we hoped to do). 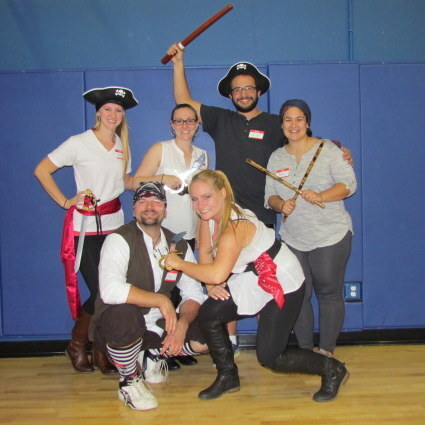 Thus, the “Pirates of the Cure-A-Being” rallied its troops and headed south to Chelsea Piers, CT, equipped with all the brains, brawn and pirate garb we believed necessary to secure a third victory for MVC. The challenge saw a great turnout with ten teams (up from six last year!) signed up to compete in a series of events that would put us all to the test. Following a two year tradition, the nature of these events was kept secret until game day. 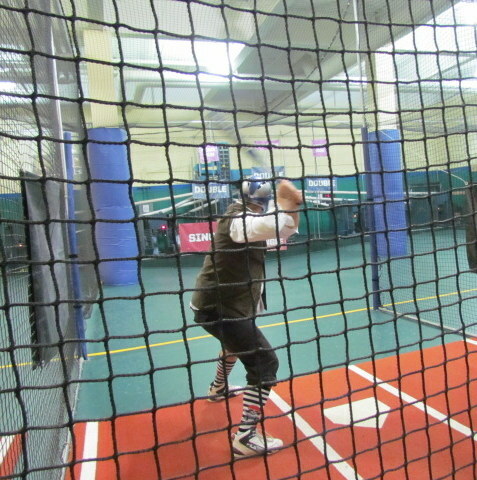 First up was the batting cage and ten swings each for five from our team. 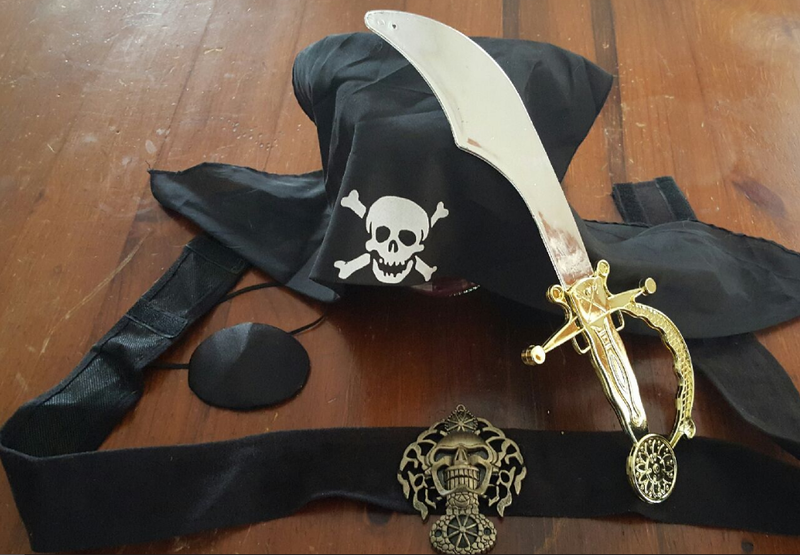 Once tricornes and swords were swapped for helmets and bats, the pirates were briefed on the scoring system and ready to go. One point would be awarded for tapping the ball past the foul line and two for sending it into the “home run” net. Chris wasted no time setting a high bar hitting ten for ten, with a handful of balls making it to the home run mark. Shannon, Jesse, Jeff and Kayla followed close behind, earning themselves a respectable number of hits as well. We were off to a great start, and loaded with confidence we headed down the hall to our next challenge. 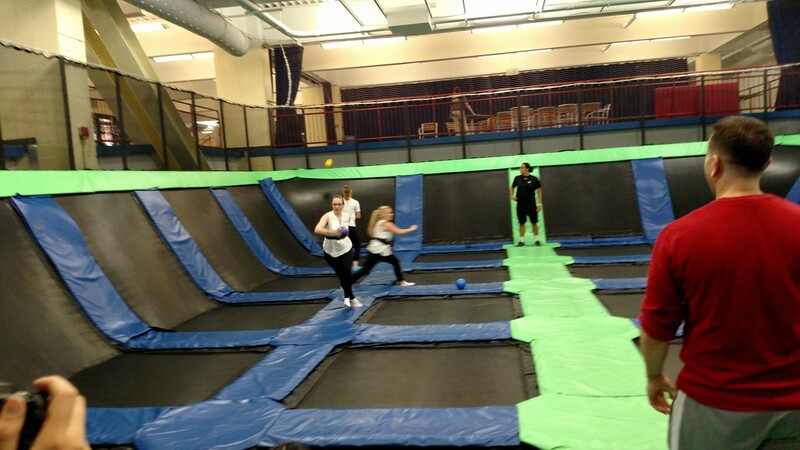 Trampoline Dodgeball, introduced last year, made its return as the second event, with our pirates recounting memories of last year’s game that left our players out of breath and tending to injuries. Upon arriving, we were told our team had been selected to play an extra round so that games would line up properly. 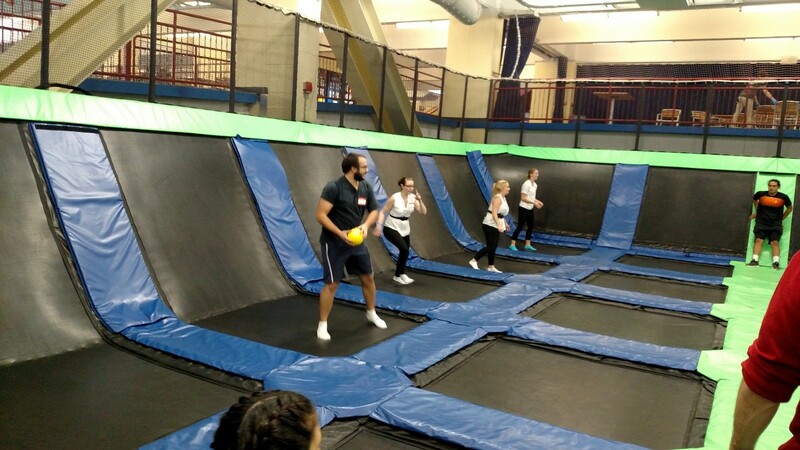 None of this would serve to discourage our ever-ready swashbucklers as they removed their boots and stepped onto the trampoline floor. 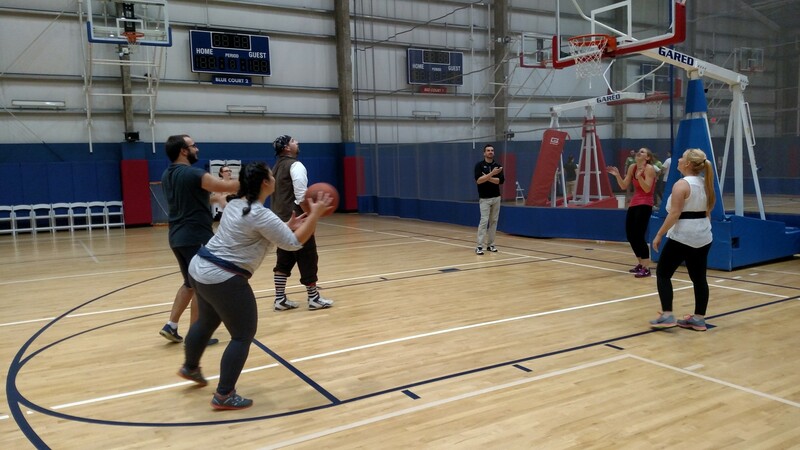 Shannon struck fear into the hearts of her opponents with her battle-ready stances while the rest of the crew swept the floor, dodgeballs flying from our hands and bodies soaring through the air to avoid their trajectories. The team had known what they were in for and came out victorious (and very out of breath) for two of our three rounds. 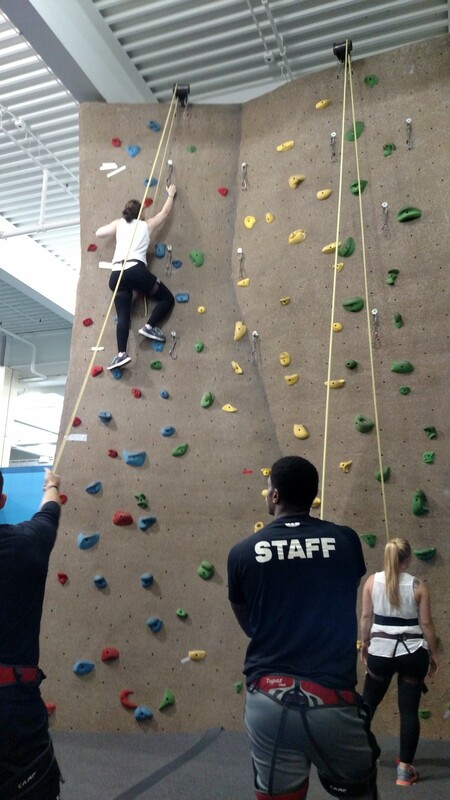 Now the team made its way to the other side of the room where we had seen others being strapped into harnesses and making their way up climbingwalls. 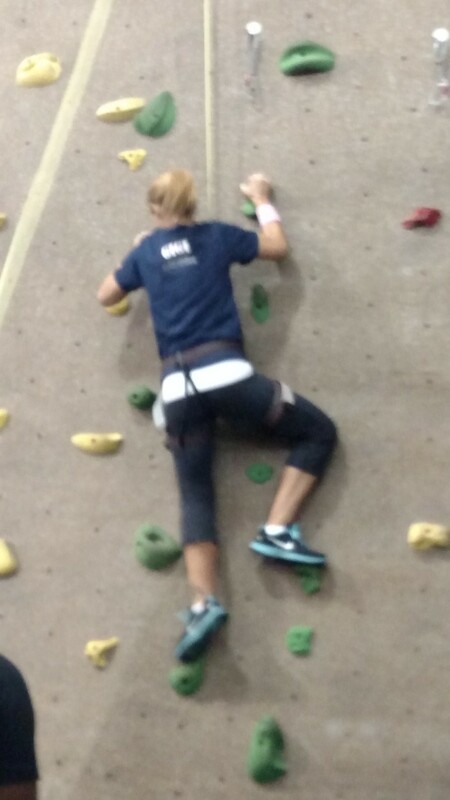 Such an event was no problem for Kayla, who to our luck enjoys rock-climbing when she isn’t manning our ship’s crow’s nest in her free time. 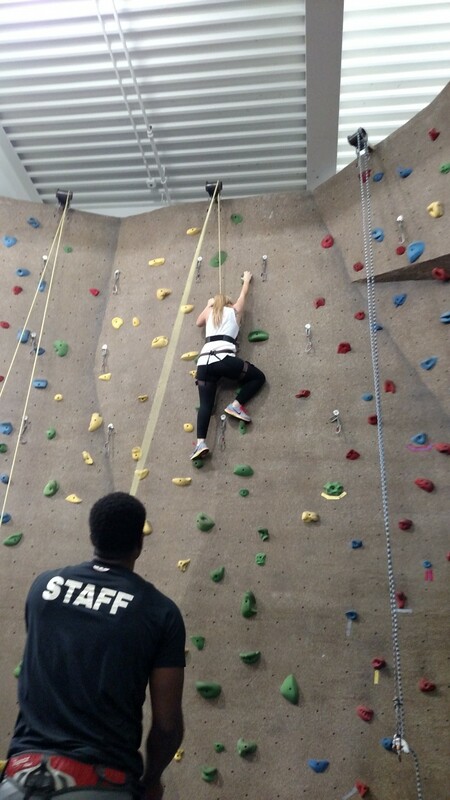 Emily surprised us all when she zipped right up the wall despite having sore wrists, and once Jesse, Jeff and Shannon had scaled the masts, Kayla took on the most difficult wall without breaking a sweat. Times were added together and our total tied that of the team currently in the lead. Next we made our way upstairs to the courts and learned that fourth up would be a basketball shooting contest. 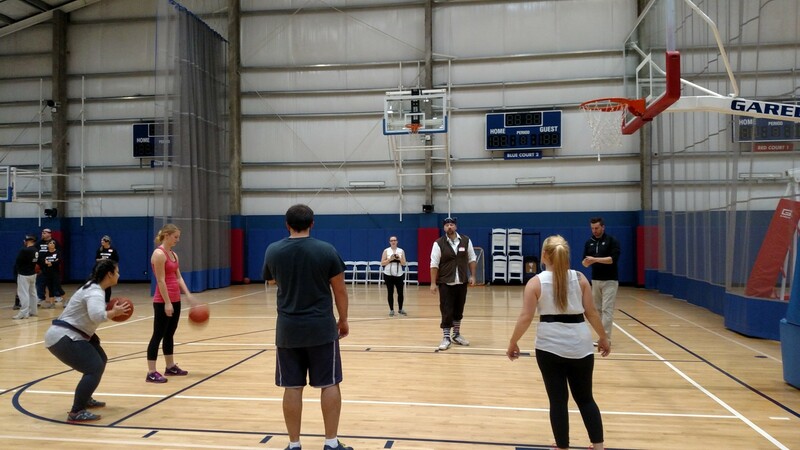 One person would stand at a distance that could earn them either one or three points per basket, with the remainder of the team strategically placed to return the ball to the shooter as quickly as possible. We put our best mates up for the five one-minute rounds and tried to score as many points as we could. 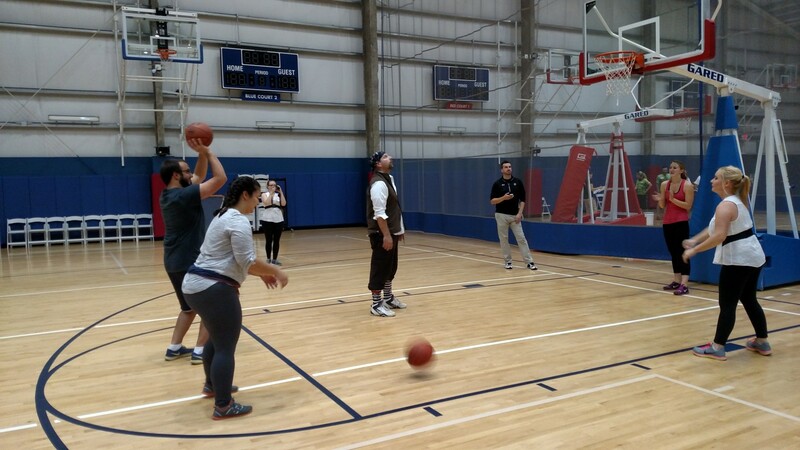 As it turns out, basketball does not very well employ the skillset of a seven seas sailing pirate. Overhearing scores of our opponents, we gathered that the competition had clobbered us this time. We looked across the court at what would be our final challenge and tried to piece together what it was, how it worked and if it would serve as our saving grace. Our first round was full of hesitation as the coalition still had not gotten the rules quite down. Erika, Kayla and I watched from the sidelines, hoping the others understood what they were doing better than we did. The minute was up, and everyone scurried to add up points. We had exceeded our 45 second limit and fell second best to our opponents. 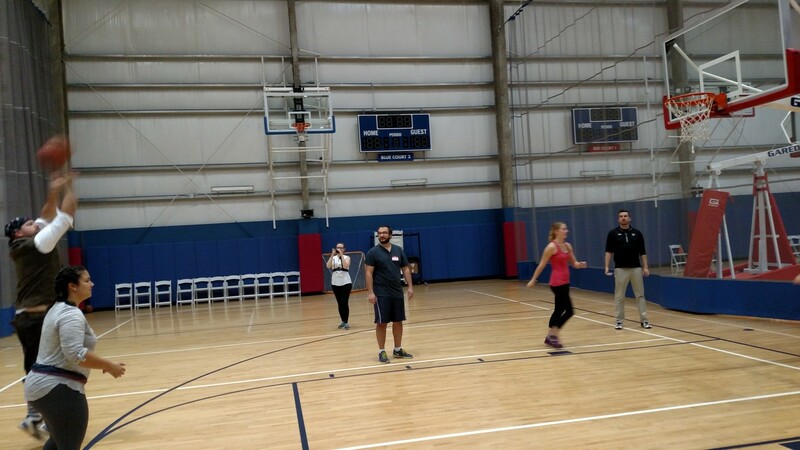 This all changed over the course of the next two rounds as runners figured out how to be backboards for the throwers and a failsafe system for tallying was conjured. We ended up being most-improved, going from around 70 points the first round to over 200 the third. 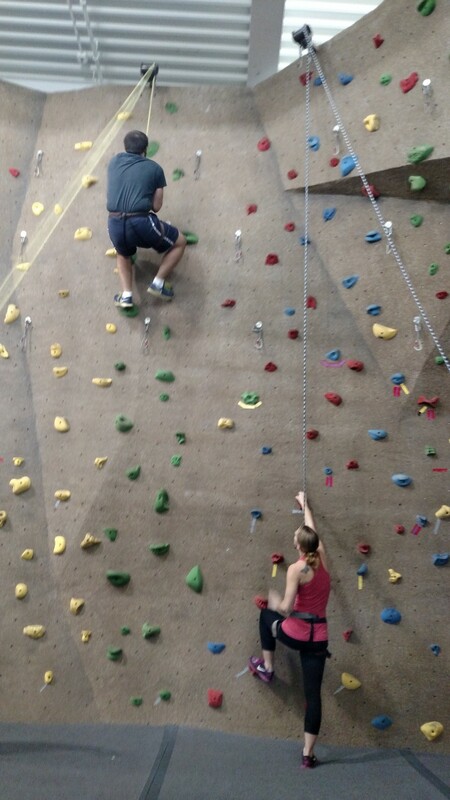 Unfortunately, it took us two of the three rounds to figure out how to beat the competition. Once the final event was over, we were directed downstairs to the bar and dining room where the teams enjoyed dinner, drinks, dessert and camaraderie. Minutes went by slowly, as we knew that once everyone had their fill, winners would be announced. Finally, that time came. Despite our most valiant efforts, the trophy for first place did not make its return to MVC, but we did manage to secure third place! First place went to the "Big Reds" group and second to "Meadow with Attitude”. Prizes for other categories were handed out as well, with Best Team Name going to “The Castrators” (whose black and red jerseys left Chris and Jeff feeling uncomfortable), Team Spirit to “The Bedazzled Bunnies” and Best Costumes to team "Invictus”.